Chempad® Presaturated Wipes are general purpose, super saturated, lint-free cleaning felt wipes. They are excellent for general purpose cleaning of computers, office and laboratory equipment. These highly effective cleaning wipes are ideal for cleaning sensitive surfaces, fiber optic connectors, electronics components, touch keypads, keyboards, instrument housings, and magnetic tape heads. 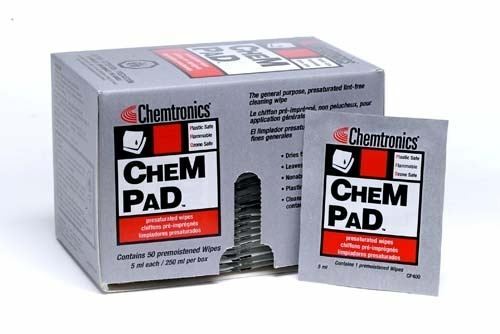 Chempad® quickly and safely removes handling soils, dirt and oxides from PCB’s, mechanical / electrical assemblies and other electronic equipment. Chempad® is especially effective in removing ink and permanent marker. Orders of CP400 placed before 4:00 pm will ship the following work day!